>Of auctions and green birds..
I’m feeling the need to mention that somehow that end of that facing bead looks like it may be chipped..Its a change or coloration in the ivory glass that is photographing oddly. Do you see the magpie in the bottom? 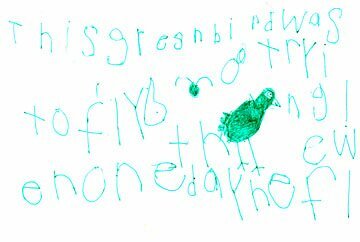 Miss Birdie herself drew me the magpie one day complete with story. I loved it so much I made a brush of the bird with Adobe photoshop. He is now my official Sweetwater Designs mascot and goes everywhere the beads go in some form or other. He’s on my carding and my stickers and will also perch somewhere in my listings and auctions..isn’t he adorable? and very fitting for this listing that’s up right now since I can see him in the glass..far right of the bottom bead…is that strange or what!? § 5 Responses to >Of auctions and green birds..
>Oh, that is very cute! I like the bird saying and the bird. The beads are really lovely. Great stuff! >Beautiful beads, lovely colors…and I can see the bird! You are currently reading >Of auctions and green birds.. at fireandglass.